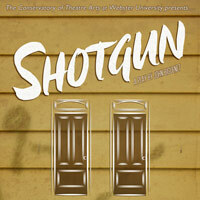 The Conservatory of Theatre Arts at Webster University presents the St. Louis premiere of John Biguenet’s 2009 drama "Shotgun," Dec. 2-6 and 9-13 in Stage III on the ground floor of Webster Hall. Performances begin at 7:30 p.m. with 2 p.m. matinees on Sundays. Tickets cost $12 for adults, $6 for seniors, students and Webster alumni. Tickets are free for Webster students, faculty and staff, and may be reserved by calling 314-968-7128. Written by a witness of the aftermath of Hurricane Katrina, "Shotgun" explores the lives of the people of New Orleans after the collapse of the city’s levees. Racial tensions are placed under a microscope when the storm brings an unlikely group under the same roof: a "shotgun" style home, whose rooms vertically align so that one could theoretically fire a bullet directly through the home. "Shotgun" is intended for mature audiences and the script as written contains strong language that is true to the time period of the play. Watch a trailer for "Shotgun" here.